Kentaro Kobayashi describes himself as a “writer, illustrator and performer, among other things”. In Mr Potsunen he brings all of these talents to bear- with minimal staging and a rich variety of animations projected on the background. Dialogue is minimal; Mr Potsunen spends a lot of time alone busying himself with stage, intricate hobbies and attempts at pet-keeping. These are expressed through deft, comic movements. 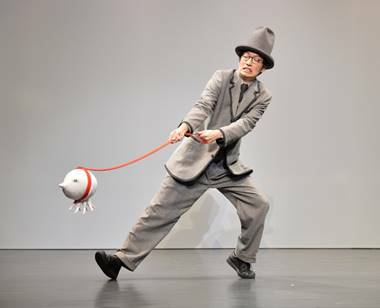 The mime can be very fluid and modern but also includes some variations on familiar classics like the invisible box and difficulties with doors. There are moments where he speaks with other characters in Japanese but it is always very clear what they are talking about from context. Overall, the aesthetic is dreamlike and surreal. Themes and references include Escher, Alice in Wonderland, and shades of Yellow Submarine, and we explore Mr Potsunen’s life through unusually literal metaphors. If I had one criticism, it’s that I’d like to see more of Mr Kobayashi- the animations are fun, but there are moments where it feels like he has been gone for a rather long time, and fundamentally we are there to see him! We all enjoyed ourselves immensely, and were giggling almost constantly. There aren’t many belly laughs in Mr Potsunen, and the humour is gentle rather than cutting. There’s a lot to this show and occasional unsettling moments, but nothing more frightening than Scooby Doo, and it’s definitely family friendly. Notting Hill Gate is pretty central, and a short jaunt from Portabello Road if you’re making an evening of it. If you’re grabbing dinner on the way from the station do what I did and grab patisserie from Paul.